Every instructional design, every coaching conversation, all the strategic advice given by Gumball practioners is customized, customized in that it is built for a particular leader and their organization given their specific situation. 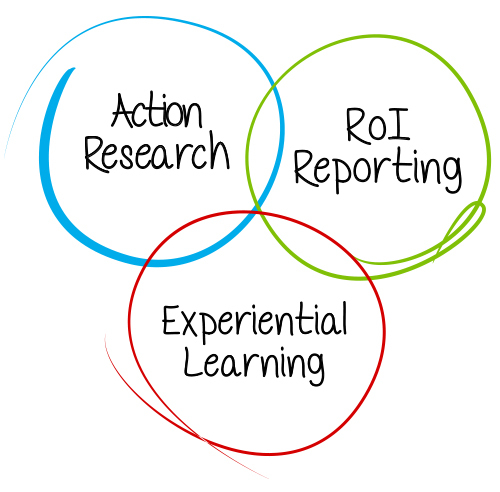 As behavioral scientists, our customization begins with action research, supported by design thinking, then deployed through experiential learning, and finalized with measuring short-term impact and long-term sustainable behavioral change. Gumball’s leadership development experiences are likened to Dr. Brown’s description of play, “Play allows ‘pretend’ rehearsal for the challenges and ambiguities of life, yet a rehearsal in which life and death are not at stake”. At Gumball we’ve coined this type of play, ‘leadership scrimmages’. Gumball’s ‘leadership scrimmages’, are not simulations, or board games. They are, like in sports, a time where ‘corporate athletes’ prepare for the situations they are actually facing in their current and real business. Sometimes it even includes watching the ‘game film’, and most of the time there are multiple scrimmages designed into a comprehensive leadership development program. In a nutshell, Gumball’s secret sauce to staying relevant to our customers is our inherent ability to scientifically design original leadership development experiences customized to the environment, that target the root causes for success and failure, within a given leader, a leader’s team, or the leader’s entire organization. However, having an excellent learning experience is only the beginning of a truly effective development process. Gumball customers pay us to assure leaders apply their learning, not intellectualize it. They also pay us to assure that once the learning is applied, it actually moves their business forward in a positive way. So unless there are measurable correlations between what’s been designed, experienced, and applied, to that of the actual impact on the business, the return on investment is unclear and the work unfinished. Gumball is not a flavor-of-the-month business or a business who’s willing to gain a reputation for utilizing a flavor-of-the-month methodology. Therefore, the job isn’t done until we assess and report on the ROI of every engagement, which is also a part of our inherent processes. Be it time, (which can also translate into money saved), quality, or cash, given the research on returns in our field of work, it’s safe to project a 5 to 7 times return on our client’s initial investment.